Everyone loves a Benny – but here's how we do it with an on trend twist. Mix water and vinegar in desired poaching pot. Bring to boil. In a pot heat, KNORR Garde d'Or Hollandaise Sauce. Once hot, add in avocado flesh. Using a stick blender, blitz until smooth. Crack and carefully place eggs in simmering water. Poach eggs till just firm and yolks still runny. Remove using a spider or slotted spoon and drain on kitchen paper. Half and toast English muffins. 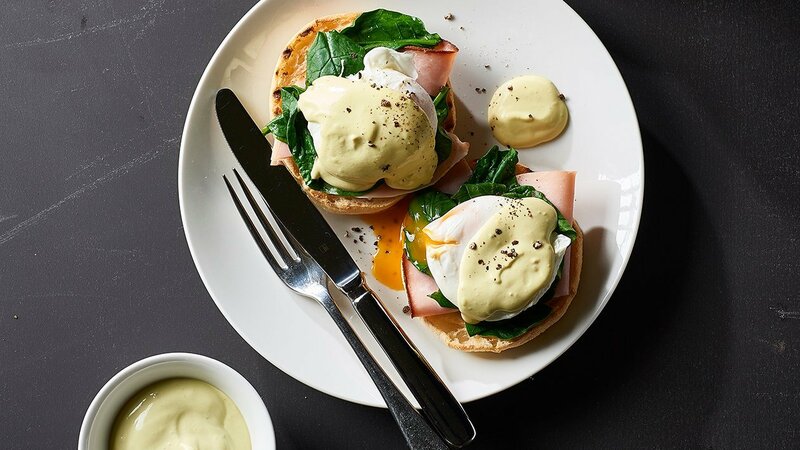 Place sliced spinach, ham, poached egg onto toasted muffin and spoon over hot Avo Hollandaise Sauce.